The SUPERPULSATOR® Clarifier combines basic chemical principles and proven clarification technology in a high-rate, solids contact clarifier that offers maximum efficiency. The unique design combines flocculation and clarification functions in one basin for optimal use of space. Vacuum generated flow pulsations create a homogeneous sludge blanket that results in excellent effluent quality at minimal operating costs. 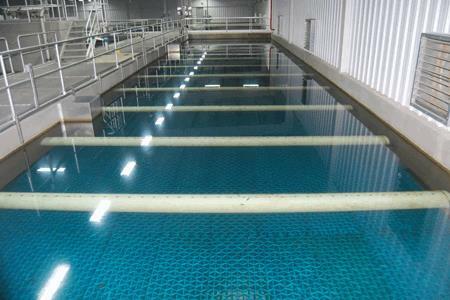 The SUPERPULSATOR® clarifier combines the principles of a sludge blanket and solids contact system into a single, high-rate, clarification unit. Capable of removing turbidity, color, TOC and other constituents in both municipal and industrial water applications, the SUPERPULSATOR® treats billions of gallons of water per day in hundreds of installations throughout the world.